Books and other paged media often use special techniques to display information. Content may be moved to or generated for special areas of the page, such as running heads or footnotes. Generated content within pages, such as tab leaders or cross-references, helps readers navigate within and between pages. CSS is a language for describing the rendering of structured documents (such as HTML and XML) on screen, on paper, in speech, etc. This draft updates the earlier draft of GCPM and, where content has been moved to other modules, an appendix indicates the current location of each. Appendix A: Where Are They Now? Paged media have many special requirements for the display of document content, which have evolved over the long history of printed books. Running headers and footers function as aids to navigation. Notes may appear at the bottom of the page, as footnotes. The properties of pages themselves may change based on their content or position in the document. Leaders visually connect related content. Cross-references may require generated text. Some paged media formats such as PDF use bookmarks for navigation. This module defines new properties and values, so that authors may bring these techniques to paged media. [CSS3PAGE] describes the sixteen page margin boxes which can be used for running headers and footers, but does not describe a mechanism for inserting content in those boxes. This module provides two methods for for doing so. Named strings copy text for reuse in margin boxes. Running elements move elements (complete with style and structure) from the document to margin boxes. The string-set property copies the text content of an element into a named string, which functions as a variable. The text content of this named string can be retrieved using the string() function. Since these variables may change on a given page, an optional second value for the string() function allows authors to choose which value on a page is used. The string-set property contains one or more pairs, each consisting of an custom identifier (the name of the named string) followed by a content-list describing how to construct the value of the named string. content-list expands to one or more of the following values, in any order. A counter() function, as described in [CSS21]. A counters() function, as described in [CSS21]. The content() function, described below. The string value of the ::before pseudo-element, determined as if white-space: normal had been set. The string value of the ::after pseudo-element, determined as if white-space: normal had been set. The content values of named strings are assigned at the point when the content box of the element is first created (or would have been created if the element’s display value is none). The entry value for a page is the assignment in effect at the end of the previous page. The exit value for a page is the assignment in effect at the end of the current page. Whenever the value of the element changes, the value of the named string(s) is updated. User agents must be able to recall many values of the named string, as the string() function can return past, current, or future values of the assignment. The value of the named string “header” will be “Chapter 1: Loomings”. The value of the “header” string will be “Loomings”. The string() function is used to copy the value of a named string to the document, via the content property. This function requires one argument, the name of the named string. Since the value of a named string may change several times on a page (as new instances of the element defining the string appear) an optional second argument indicates which value of the named string should be used. The value of the first assignment on the page is used. If there is no assignment on the page, the entry value is used. first is the default value. If the element is the first element on the page, the value of the first assignment is used. Otherwise the entry value is used. The entry value may be empty if the element hasn’t yet appeared. The exit value of the named string is used. This is identical to first, except that the empty string is used on the page where the value is assigned. 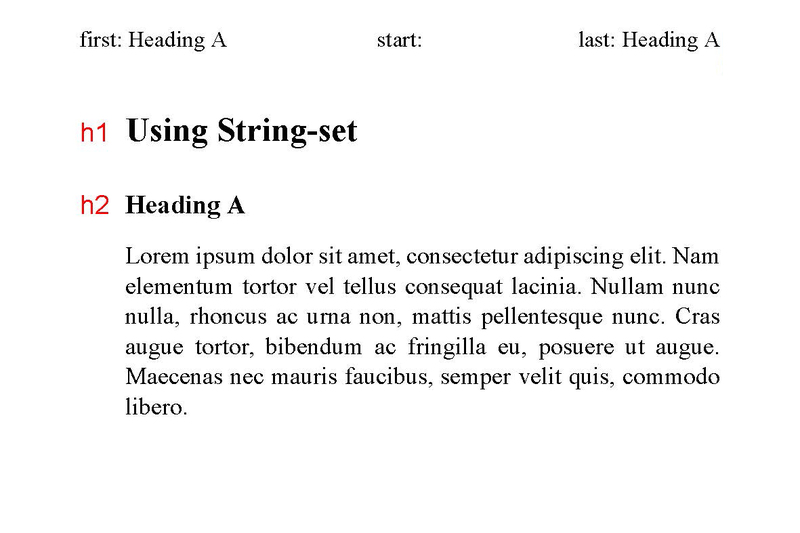 The following figures show the first, start, and last assignments of the “heading” string on various pages. The start value is empty, as the string had not yet been set at the start of the page. Since the page starts with an h2, the start value is the value of that head. Since there’s not an h2 at the top of this page, the start value is the exit value of the previous page. Many headers and footers cannot be represented only by unformatted text. A book title serving as a running head may contain an italic word, for example. 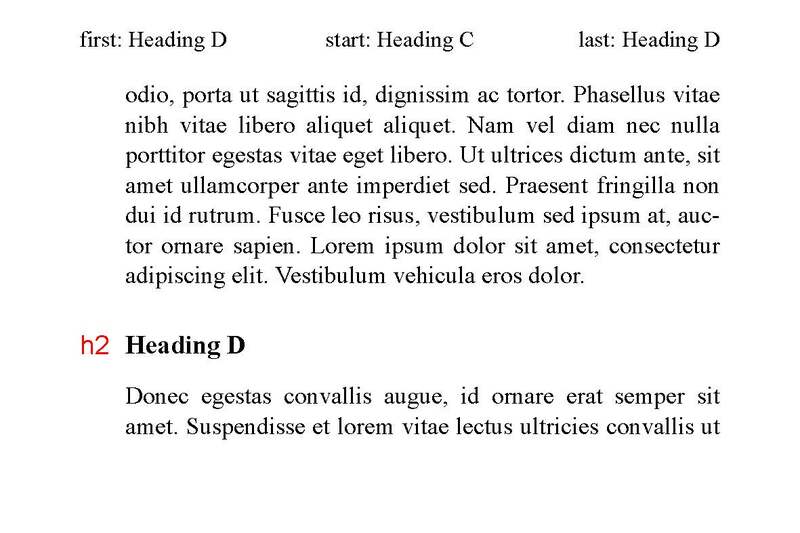 A mechanism is needed to move or copy elements into margin boxes. To do this, we add the running() value to the position property, and the element() value to the content property. In this example, the h1 element is placed in the @top margin box, complete with formatting and any descendant elements. It does not display in the normal document flow. position: running(custom-ident) removes the element (and associated ::before and ::after pseudo-elements) from the normal flow, and makes it available to place in a page margin box using element(). The element inherits from its original position in the document, but does not display there. The element value() can only be used in page margin boxes. And it cannot be combined with other possible values for the content property. This idea would be much more useful if we could also copy (rather than just move) elements. That would avoid the duplication of HTML in the example above. Bert Bos has proposed an alternative syntax, which allows both moving and copying elements into running heads. 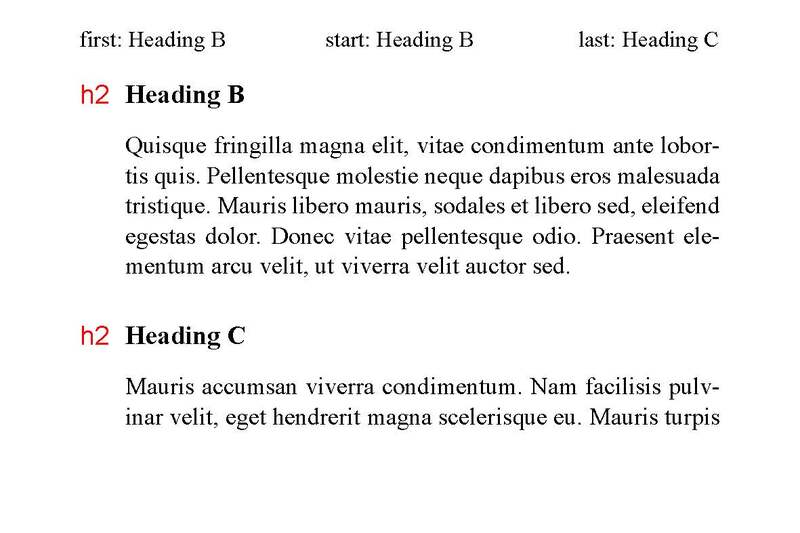 In the example below, h2 elements appear in their normal place in the document, but are also copied into running heads. The element() value of the content property places an element (which has been removed from the normal flow via running()) in a page margin box. Whenever the value of the element changes, the value of element() is updated. Just as with string(), element() takes an optional keyword to describe which value should be used in the case of multiple assignments on a page. User agents must be able to recall many values, as element() can return past, current, or future values of the assignment. Ancillary content may be moved to the bottom or side of a page. A footnote is created when such content moves to the bottom of the page, leaving a reference indicator. Footnotes are complex objects (see the footnote section at [dpub-latinreq]), so it will be helpful to define some terms before proceeding. A number or symbol adjacent to the footnote body, identifying the particular footnote. The footnote marker should use the same number or symbol as the corresponding footnote call, although the marker may contain additional punctuation. The footnote marker is placed before the footnote element, and together they represent the footnote body, which will be placed in the footnote area. A number or symbol, found in the main text, which points to the footnote body. The page area used to display footnotes. The footnote element is removed from the flow, and a ::footnote-call pseudo-element is inserted in its place, which serves as a reference to the footnote. 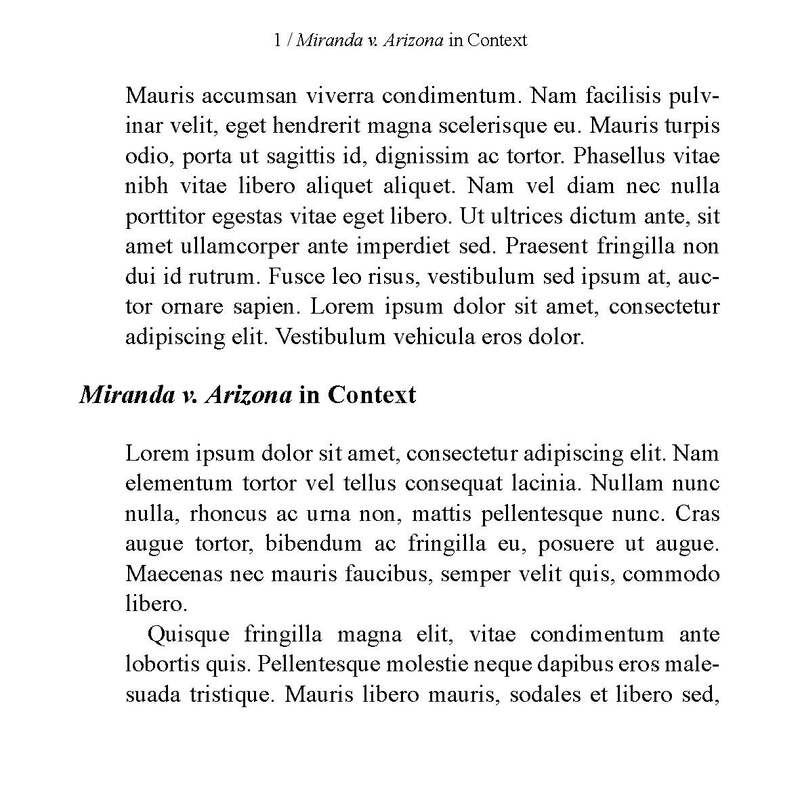 A ::footnote-marker pseudo-element, identifying the footnote, is placed at the beginning of the footnote element. Together this is the footnote body. The footnote counter is incremented. The footnote body is placed in the footnote area at the bottom of the page. Footnote elements from a given page are placed in the footnote area of that page in document order. Why is float:bottom used with the footnote area? Floating footnotes to the footnote area, and then floating the footnote area itself, seems overly complex, given that implementations don’t allow the footnote area to float anywhere else. Note that some implementations do allow the footnote area to be absolutely positioned. The footnote-display property determines whether a footnote is displayed as a block element or inline element. The user agent determines whether a given footnote element is placed as a block element or an inline element. If two or more footnotes could fit on the same line in the footnote area, they should be placed inline. 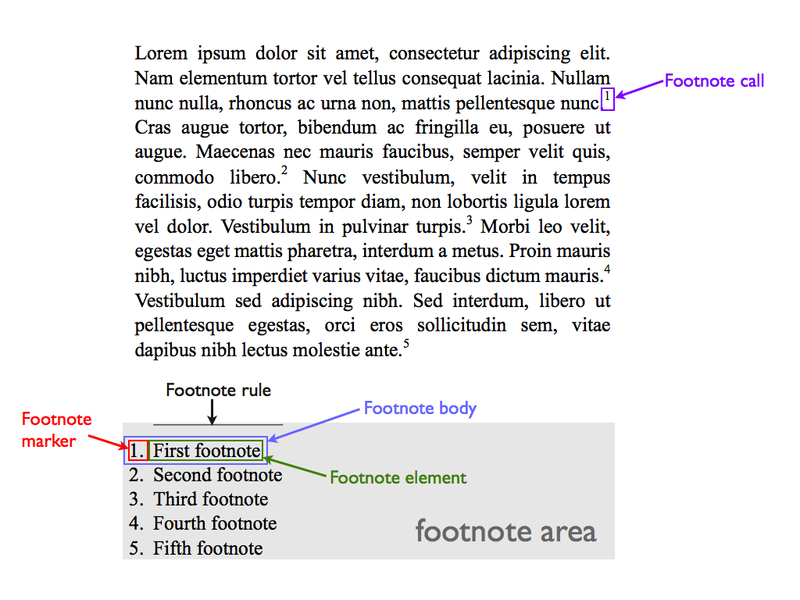 A page area that can be used to display footnotes is described in the page context using an @footnote rule. This rule defines a box that, if used, will contain all the footnote elements that appear on that page. How would one describe this in the grammar of CSS3-Page? The bottom margin edge of the footnote area is positioned so that it touches the bottom of the page area. The footnote area can only contain footnotes. How do footnotes work in multi-column text? Prince uses float: prince-column-footnote to create a footnote at the bottom of a column rather than the bottom of a page. Implementations that support footnotes generally support page floats like float: bottom. Page floats should end up above the footnote area. How might this be specified? The max-height property on the footnote area limits the size of this area, unless the page contains only footnotes (as may happen on the last page of a document). Since it is undesirable for a page to consist only of footnotes, user agents may set a default max-height value on the footnote area. The footnote counter is a predefined counter associated with the footnote element. Its value is the number or symbol used to identify the footnote. This value is used in both the footnote call and the footnote marker. It should be incremented for each footnote. The footnote counter, like other counters, may use any counter style. Footnotes often use a sequence of symbols. The footnote counter may be reset on each page. Note that the value of the footnote counter should depend on the position of the footnote element in the document tree, not where it is eventually placed. A footnote element may sometimes be placed on the page after the footnote call, but the same counter value must be used for both. A ::footnote-call pseudo-element is inserted in place of the footnote element when the latter is removed from the flow. By default, the content of this pseudo-element is the value of the footnote counter, styled as a superscripted number. The ::footnote-marker pseudo-element represents the footnote element’s marker, the number or symbol that identifies each footnote. This pseudo-element behaves like a ::marker pseudo-element, as defined in [CSS3LIST]. It is placed at the beginning of the superior parent’s content, and is inline by default. The ::footnote-marker can be styled just as other ::marker elements can be. The default style should include list-style-position: inside. Rendering footnotes can be complex. If a footnote falls near the bottom of the page, there may not be enough room on the page for the footnote body. The footnote-policy property allows authors some influence over the rendering of difficult pages. The user agent chooses how to render footnotes, and may place the footnote body on a later page than the footnote reference. A footnote body must never be placed on a page before the footnote reference. If a given footnote body cannot be placed on the current page due to lack of space, the user agent introduces a forced page break at the start of the line containing the footnote reference, so that both the reference and the footnote body fall on the next page. Note that the user agent must honor widow and orphan settings when doing this, and so may need to insert the page break on an earlier line. As with line, except a forced page break is introduced before the paragraph that contains the footnote. The next level will include sidenotes, column footnotes, and multiple footnote areas. A paginated document consists of a sequence of pages. [[CSS3PAGE]] defines page selectors, which allow the selection of the first page of the document, left and right pages, and blank pages. Here we extend the idea of page selectors to enable the selection of arbitrary document pages. The nth() page pseudo-class allows the selection of arbitrary document pages. This pseudo-class takes an argument of the form An + B as defined in [CSS3SYN]. When applied to the default @page rule, nth() selects the document page whose index matches the argument. nth() is not related to the page counter, which may reset and use various numbering schemes. 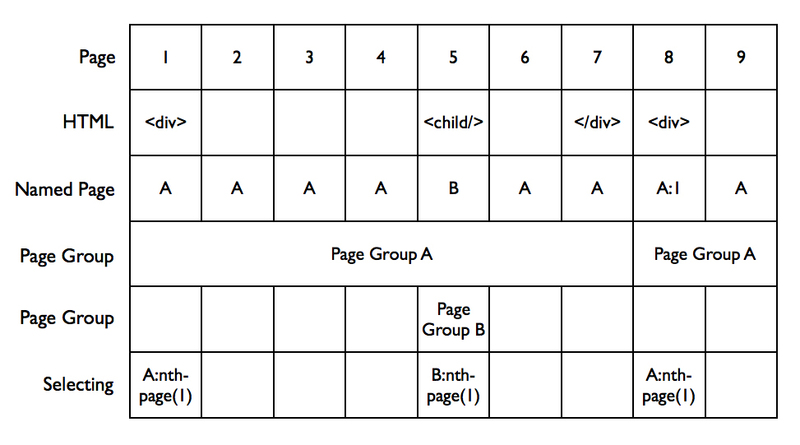 When the nth() selector is applied to a named page, and that named page is part of a page-group (see below), it selects the nth page in the page group. This selects the first page of the document. This selects all even document pages. Many paginated documents have a repeating structure, consisting of many chapters, sections, or articles. The first page of each subdivision often requires special treatment, but [CSS3PAGE] doesn’t define a way to select the first page of each chapter (as distinct from the first page of the entire document). When the page property is applied to an element that also has a forced break property applied, a page group is created. The page group is the collection of all pages created by an instance of that element. When a new instance of the element is rendered, a new page group is started. A page may be part of several page groups, as a given page group may have ancestors or descendants that are part of another page group. A page may be part of several page groups. In this case, each chapter will form a separate page group. @page:nth(3 of body) will select the third page of each chapter, even if that page happens to use the “broadside” named page. @page:nth(1) will select only the first page of the document, as will @page:first. 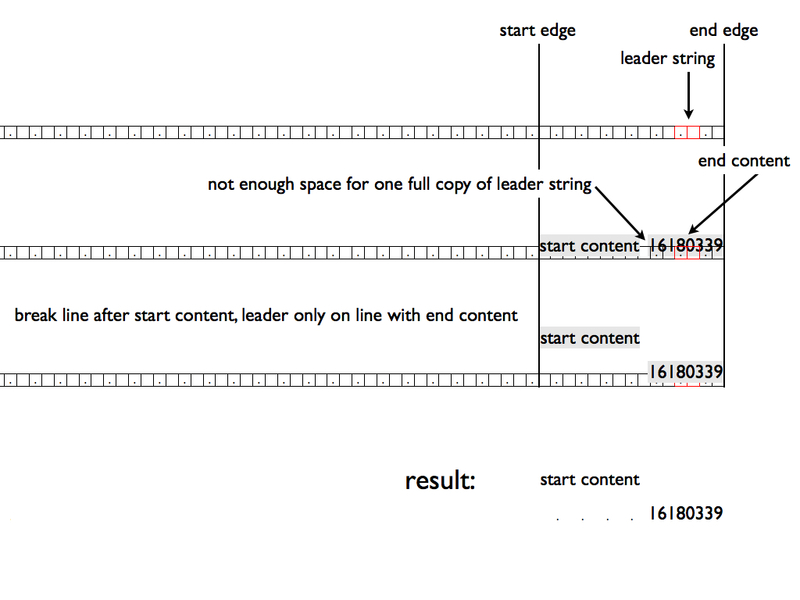 A leader, sometimes known as a tab leader or a dot leader, is a repeating pattern used to visually connect content across horizontal spaces. They are most commonly used in tables of contents, between titles and page numbers. The leader() function, as a value for the content property, is used to create leaders in CSS. This function takes a string (the leader string), which describes the repeating pattern for the leader. Do leaders depend on the assumption that the content after the leader is right-aligned (end-aligned)? The leader string must appear in full at least once. Visible characters in leaders should vertically align with each other when possible. Line break characters in the leader string must be ignored. White space in the leader string follows normal CSS rules. A leader only appears between the start content and the end content. A leader only appears on a single line, even if the before content and after content are on different lines. A leader can’t be the only thing on a line. Lay out the before content, until reaching the line where the before content ends. The leader string consists of one or more glyphs, and is thus an inline box. A leader is a row of these boxes, drawn from the end edge to the start edge, where only those boxes not overlaid by the before or after content. 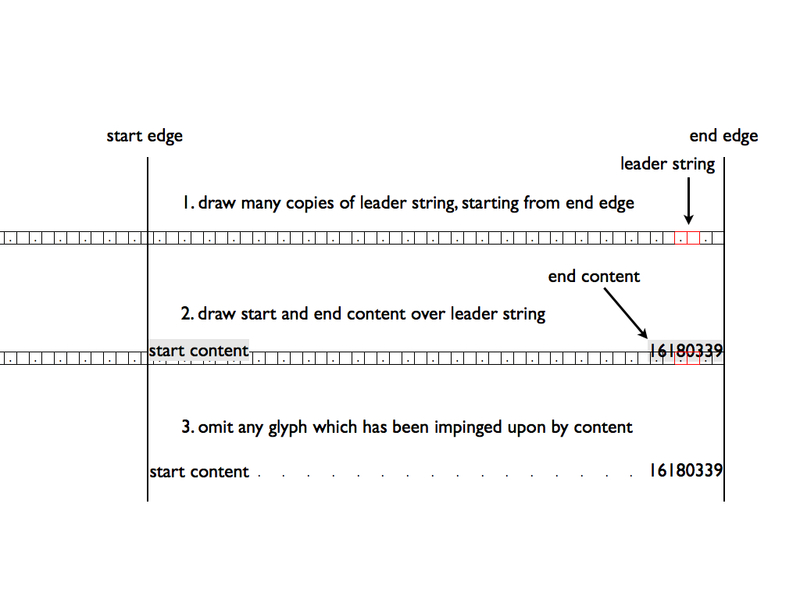 On this line, draw the leader string, starting from the end edge, repeating as many times as possible until reaching the start edge. Draw the before and after content on top of the leader. If any part of the before or after content overlaps a glyph in a leader string box, that glyph is not displayed. Three new values for the content property are used to automatically create these types of cross-references: target-counter(), target-counters(), and target-text(). Each of these displays information obtained from the target end of a link. The target-counter() function retrieves the value of the innermost counter with a given name. The required arguments are the url of the target and the name of the counter. An optional counter-style argument can be used to format the result. These functions only take a fragment URL which points to a location in the current document. If there’s no fragment, if the ID referenced isn’t there, or if the URL points to an outside document, the user agent must treat that as an error. …which will be discussed on page <a href="#chapter4_sec2">000</a>. …which will be discussed on page 137. This functions fetches the value of all counters of a given name from the end of a link, and formats them by inserting a given string between the value of each nested counter. I have not found a compelling example for target-counters() yet. The target-text() function retrieves the text value of the element referred to by the URL. An optional second argument specifies what content is retrieved, using the same values as the string-set property above. …which will be discussed <a href="#chapter_h1_1">later</a>. Result: …which will be discussed later, in the chapter entitled Loomings. Some document formats, most notably PDF, allow the use of bookmarks as an aid to navigation. Bookmarks provide a hierarchy of links to document sections, as well as text to label the links. A bookmark has three properties: bookmark-level, bookmark-label, and bookmark-state. defines the level of the bookmark, with the highest level being 1 (negative and zero values are invalid). <content-list> is defined above, in the section on the string-set property. The value of <content-list> becomes the text content of the bookmark label. The bookmark label will be “Loomings”. Bookmarks typically toggle open and closed, with the open state displaying the next level of bookmarks. The bookmarks of the nearest descendants of an element with a bookmark-state of open will be displayed. any bookmarks of descendant elements are not initially displayed. Many sections which were in the 29 November 2011 Working Draft have been moved to other specifications. Here are some notes on where things have moved. This section has been moved to CSS Paged Media Module Level 3. This section has been moved to CSS Color Module Level 4. This section has been moved to CSS Overflow Module Level 3. This is discussed in WHATWG CSS Books. This section has been moved to CSS Page Floats. A brief mention of selecting columns is found in WHATWG CSS Books. This appendix is informative, and is to help UA developers to implement a default stylesheet for HTML, but UA developers are free to ignore or modify as appropriate. The spec has a new editor. All text and examples rewritten. Added attr(<identifier>) value to string-set property. This is supported by both Prince and AntennaHouse. Added footnote-policy property to control rendering of footnotes in difficult situations. Added footnote-display property to allow inline footnotes. Removed page-group property, and added optional argument to nth() page pseudo-class to allow selection within page groups. CMYK Colors section moved to CSS Colors Level 4. Paged Presentations section moved to CSS Overflow Module Level 3. CSS Books does not have the footnote-display property. CSS Books does not have the footnote-policy property. The relationship between the nth() page pseudo-class and the page-group concept is clarified, which may make the page-group property redundant. This specification does not redefine the :first page pseudo-selector to select the first page of a page-group. This work would not be possible without the immense contributions of Håkon Wium Lie. Chris Lilley, Elika J. Etemad, Alan Stearns, L. David Baron, Bert Bos, and Liam Quin have provided valuable feedback.